Completamente remodelado em novembro de 2018, esta é uma casa de três quartos em dois níveis com a sua própria piscina privada, além do uso da piscina da comunidade nas proximidades. Nova cozinha equipada, novas camas e roupa de cama, novas portas de terraço deslizantes, novas portas e armários internos, degraus antiderrapantes, redesenhar, redesenhar e remontar, além de novas unidades de ar condicionado. Três quartos com um sofá-cama novo na grande sala de estar. Uma casa de banho para quartos master e segundo, segundo a casa de banho no andar inferior para o terceiro quarto. Terraço de dois andares espaçoso com churrasco built-in. Nós possuímos a casa definitiva, então descansar nada assegurada virá entre você e suas férias. A casa está em total conformidade com a lei de locação da Andaluzia. Casa de banho principal com banheira, chuveiro anexo, duche separado com chuveiros individuais, bidé e WC Segunda casa de banho no andar de baixo com chuveiros duplos, pia e vaso sanitário., Para os ocupantes do terceiro quarto. Notas sobre alojamento: Mesas de cabeceira e lâmpadas em todos os quartos. Cofre no quarto principal. Ferro, tábua de passar e secar quadro. Tomada de corrente dupla do Reino Unido com carregamento por USB. Tapetes atraentes por toda parte. A 'pacote de boas vindas "é fornecido e há um agente britânico na mão para garantir uma estadia livre de problemas. Exterior: Piscina privada, aproximadamente 8m x 3m, 0. 75m a 1. 9m de profundidade, com passos romano na parte rasa. Grande terraço, incluindo antiderrapantes telhas de surround piscina. Duas mesas externas, com oito cadeiras e um guarda-chuva. Seis espreguiçadeiras, churrasqueira de tijolos construída. Serviço de limpeza / toalhas / linho / empregada doméstica: Roupa de cama e toalhas fornecidos, mas não toalhas de praia grande. Mudou depois de uma semana para duas reservas de semana. Totalmente limpos entre os reservas. Very very nice little find in Nerja. Huge cooking/dining/living area and a big outside space. Plenty of room for 6 people to get on with their business. Location is really handy, so close to beach and old town. Will definitely go back in the future if possible. Thanks very much for your review. The house has been much refurbished in the Autumn of 2018, making it even more desirable for those who wish to be near the beach and within walking distance to the town centre. It's quite probably the nearest property to the beach with its own pool. Gut gelegen, könnte bei besserer Ausstattung und Sauberkeit ein gutes Domizil sein. In der Nähe des Strandes an der Hauptstraße, deshalb laut. Schnell zu Fuß erreichbar sind ein kleiner Supermarkt und viele Restaurants an der Strandpromenade. Eine große Wohnung mit viel Platz und einem schönen Pool. Leider fehlte es an Sauberkeit, Pflege und Ausstattung - besonders in der Küche. Das Kochgeschirr war sehr abgenutzt, zum Glück gab es einen Backofen und Grill (nicht sauber!). Auf Beschwerden wurde nicht reagiert. Es wurde pro Person 1 Handtuch gestellt, erst auf Nachfrage gab ein zweites. Die Wohnung roch muffig, im Badezimmer gab es Schimmel. Die Sitzgarnituren innen waren nicht sauber, die außen waren aufgeplatzt. Im Übrigen gab es keine Gebrauchsanleitung zur Wohnung. Das Haus wird jetzt komplett renoviert, einschließlich einer neuen Küche. Leider hat das Bad keine Außenfenster, daher kann Feuchtigkeit besonders bei nassem Wetter im Oktober ein Problem sein. Wir sind überrascht, dass unsere Agenten keine Antwort darauf erhielten. Normalerweise kümmern sie sich schnell um die Anliegen der Gäste. Wir senden den Gästen vor dem Urlaub immer Hausdetails. In diesem Fall wurden sie am 23. August über HomeAway als 'pdf'-Anhang gesendet. De villa ligt op een fijne plek tussen burriana beach en het centrum van Nerja . Het prive zwembad is een zegen en ligt ideaal om wat af te koelen en te spelen. Elke week komt iemand het nakijken en bijstellen, we hebben er ook echt optimaal gebruik van gemaakt. Het huis zelf is ruim , we waren met 5 volwassenen en liepen nooit in elkaars weg. Het grote nadeel van het huis is dat het vochtig is en dat dat moeilijk te hanteren is. Bij het binnenkomen ruik je telkens opnieuw het vocht in het huis . De twee badkamers blijven lang nat na een douche, de douche boven zet de badkamer in een mum van tijd blank. Er was gelukkige nog een douche in de badkuip die prima werkte. De huisraad is een samengeraapt allegaartje maar dat stoort me niet. Er is genoeg en de afwasmachine doet haar werk. Keukenelektro is zeer sumier en een gewoon koffieapparaat was handig geweest. Ik heb nu wel het andere machientje leren gebruiken! 👍� De BBQ op het terras is geweldig en doet zijn werk meer dan naar behoren. De kinderen kwamen eerder aan dan wij en mochten probleemloos al hun intrek nemen, allemaal fijne voordelen. We hebben er geweldig van genoten maar ik zou het huis niet huren voor een verblijf in de winter. Bedankt voor uw opmerkingen en we zijn verheugd dat u van uw verblijf in het huis hebt genoten. Helaas heeft de badkamer geen buitenruit, dus condensatie kan een probleem zijn. We hopen dit najaar de ventilatie te verbeteren met een krachtigere afzuigkap. In de winter verwarmen onze airconditioningseenheden het huis, evenals ontvochtigers. Dit is een Google-vertaling, dus ik hoop dat het goed is! We had a fantastic stay. Lovely comfortable villa with our own pool. So close to the beach and easy walk into the town. We have stayed at Burriana many times and would thoroughly recommend the villa. Hope we can go back next year. We're very pleased to hear you enjoyed your stay. The house is always popular, especially as it is probably the nearest property to the beach with its own pool. We look forward to hearing from our guests again, if at any time they visit Nerja in the future. Det var en mycket trevlig stad dock mycket backar att gå i. Huset vi hyrde var mycket trevligt, nära till havet och många restauranger. English translation: "It was a very nice town, but a lot of hills to walk in. The house we rented was very nice, close to the sea and many restaurants". We're pleased to hear you enjoyed your stay. The house, with its own pool, is very near the beach an all facilities. 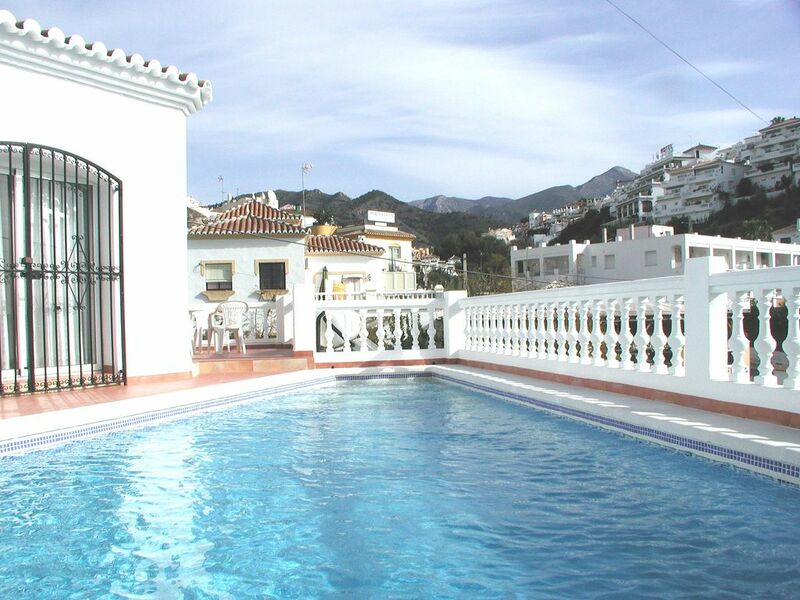 This makes it an ideal property for those who may not wish to do a lot of walking in and and around Nerja. Arrived to a small welcome pack which was appreciated. Villa is a great size with a lovely patio to enjoy a pre dinner aperitif! We didn’t get to use the pool much as it was cold (expected in April) It is in close proximity to beach (5 min walk), town centre(10-15 min walk) and supermarkets (large one 15-20 min walk) All in all we had a great week despite a mixed bag of weather! A couple of things to mention, the cleaning stuff was in a downstairs cupboard which wasn’t included in the info and this could do with some replacements. The hoover bag was so full it wasn’t picking up. As there was no replacement bags provided my Dad had to empty some of it to get the hoover to work. Also the mattresses in the triple room were not that comfortable and the bedding has seen better days. We would have also liked a few more towels as only had 4 large and 4 hand towels between 5 of us. These are just some wee things that would have taken the stay to 5 stars. Communication with owners was excellent, Derek was very responsive to emails and their property managers arranged our transfers and responded really quickly when we had a short power cut. Thanks for a great holiday. We're pleased to hear you enjoyed your stay, in spite of the unseasonal weather Nerja experienced in April. We apologise for the missing towels, each person should have their own set, including children, we can always provide extra if requested. Mattress comfort is always a difficult issue, depending on the personal preference of guests. When replacing, we've always been guided by the suppliers, as to their all-round suitability for rental properties. A três minutos a pé até a Praia de Burriana, a principal praia de Nerja. Vários bares e restaurantes, além de um pequeno supermercado em frente à praia. Dez minutos de caminhada até o centro da cidade. Málaga é o aeroporto mais próximo, a cerca de 35 milhas ou 50 minutos, com acesso à auto-estrada para dentro de uma milha do centro da cidade. Um carro não é realmente necessário, a menos que você pretende explorar a área local. Vale a pena visitar é Frigiliana, cerca de cinco milhas de distância, uma aldeia de montanha mourisco restaurado. Perto está o restaurado 'perdido' aldeia de Acebuchal, originalmente abandonado em 1948. Duas milhas da vila de pescadores de Maro com as Grutas de Nerja e duas horas de Granada e do famoso Palácio de Alhambra. Um resort muito popular, facilmente acessível a partir de Málaga e do seu aeroporto internacional, com acesso à auto-estrada para dentro de uma milha do centro da cidade. Aninhado no sopé das montanhas, a cidade velha, com suas ruas de paralelepípedos veículo estreito restrito, oferece um feriado mais tranqüilo do que a encontrada nos resorts mais elegantes da Costa del Sol. A praia mais conhecida, Burriana, é regularmente premiado com uma "bandeira azul". Com outras pequenas praias pitorescas, passeio a famosa "Balcon de Europa ', inúmeras pequenas lojas, bares e restaurantes, além de seu maravilhoso clima durante todo o ano, Nerja tem algo para todos, especialmente as famílias e o turista mais maduro. No entanto, existem algumas estradas bastante íngremes e passarelas, por isso pode não ser adequado para aqueles com pedestres ou dificuldades respiratórias. Booking Notes: We can post or email our booking form, or it can be downloaded from our own website. The deposit is £100 (£200 high and mid season) per week booked, with the balance payable 8 weeks beforehand. Changeover Day: Any day arrival or departure, subject to negotiation and existing bookings. Arrival time normally 4pm, departure 10am. Times are flexible if there is not a same-day changeover. Notes on prices: Prices shown are for the property, not per person. Extra days over a week pro-rata the weekly rate. Long winter lets price negotiable. For young families, one cot and high chair supplied free of charge, extra cot/high chair £25 p.w. We accept debit and credit card payments through the secure online facility on our own website, giving UK guests financial security under the Consumer Credit Act. DATES NOT LISTED ARE ALREADY BOOKED. LIMITED AVAILABILITY LATE SUMMER.